Some food pairings inherently don't go together, like pickles and ice cream (yuck!). But other foods, even if they sound weird at first, do go together -- like dark chocolate and Parmesan cheese. Whether you believe it or not, these two ingredients have actually been scientifically proven to pair perfectly. This food pairing isn't just hit or miss or a guesstimation -- it's actually been studied and analyzed by scientists in a laboratory. 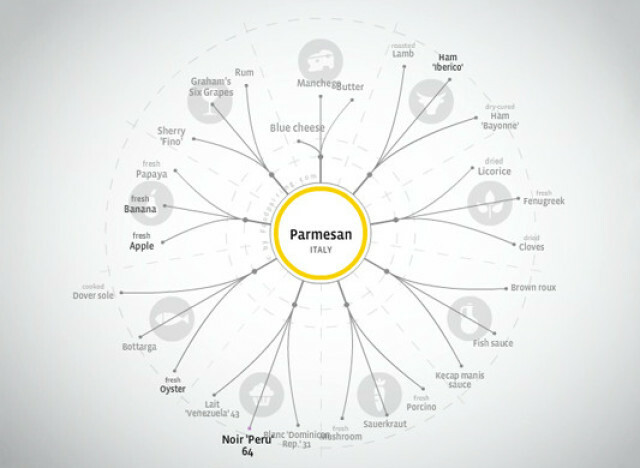 The goal of the Foodpairing method is to chart all possible food pairings to help chefs and restaurant professionals create unique dishes. Each ingredient's volatile compounds (aromas) are quantified using gas chromatography and/or a mass spectrometer. The concentrations are then compared with their respective flavor threshold and finally matched with other ingredients that have similar compounds. So you end up with oddball pairings like caviar and white chocolate (invented by chef Heston Blumenthal), or in this case, dark chocolate and Parmesan cheese. We decided to take up the challenge of pairing chocolate and Parmesan cheese in a grilled cheese sandwich. The salty and savory (umami) flavor of Parmesan cheese pairs exceptionally well with the depth of flavor in dark chocolate. The chocolate actually brings out fruity, tart notes in the cheese. According to the Foodpairing tree for Parmesan cheese (pictured above), the best chocolates to pair include dark chocolate (64%), milk chocolate (43%) and white chocolate (31%). Stick to these recommendations for the best results, though it's fine if you don't go by the specific chocolate origin as the chart suggests. Once you try our recipe (see below in the slideshow), you'll see for yourself just how amazing -- and savory -- the combination is. We'd recommend serving it with a nice red wine next time you have a few guests over. See the dishes other sites have made when pairing chocolate and parmesan cheese. What's your favorite grilled cheese combination? Let us know below. Check out some more unusual grilled cheese sandwiches and panini in our slideshow below.